Chest Infections: Is It Bronchitis or Pneumonia? Chest infections commonly follow a cold or the flu. There are two main types of chest infections in adults and children: bronchitis and pneumonia. Bronchitis typically does not require medical treatment and goes away on its own. Pneumonia, however, could require antibiotics and should be treated by a medical professional. Both bronchitis and pneumonia have similar symptoms, making it hard to tell whether you should seek treatment or just wait out your symptoms at home. The difference between bronchitis and pneumonia is that bronchitis is an inflammation of the bronchial tubes or airways to the lungs, and pneumonia is an inflammation in the lungs. Bronchitis and pneumonia infections can be caused by some of the same factors: bacteria, viruses, fungi, or inhalation of irritating substances. Bronchitis normally causes a mild fever or no fever at all. With pneumonia, fever is often higher than 101°F. With bronchitis, a cough is typically dry at first, then after a few days may bring up mucus from the lungs. 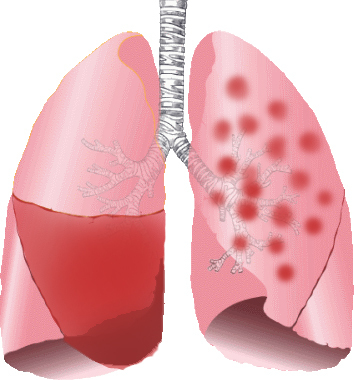 Pneumonia is typically accompanied by a wet cough that brings up mucus from the lungs. Unlike with pneumonia, x-rays of bronchitis usually appear normal. Bronchitis usually goes away in three weeks or sooner, but pneumonia typically lasts longer than two to three weeks. Because chest infections are often spread when an infected person coughs or sneezes, it’s important to cover your mouth when coughing or sneezing, washing your hands thoroughly, and seeking medical treatment right away if you have concerns. If you suspect that you have pneumonia or bronchitis, the best thing you can do is head to your local FastMed Urgent Care. With on-site x-rays, we’ll be able to help determine what type of chest infection you have and get you feeling better in no time. FastMed offers prompt medical treatment for non-life-threatening medical conditions 365 days a year. Each of our locations has extended hours, and our staff members are dedicated to providing you with quality personal medical care.